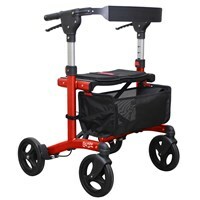 Escape Rollator - Standard 24 in. Seat Height - Red is constructed of lightweight aluminum and folds easily for transport. Rollator Weight Capacity: 275 lb.